"20V Max 7 1/4"" Cordless Sliding"
The DeWalt Jig Saw features a variable speed 0 - 3000 SPM motor for plenty of power and the versatility to tackle a variety of materials and applications. The anti-slip comfort grip gives you increased comfort and control for all-day use, while the battery fuel gauge with three LED lights lets you monitor run time easily. 20V Max 7.25-inch Cordless Sliding Compound Miter Saw (Tool Only) "20V Max 7 1/4"" Cordless Sliding"
20V Max 7.25-inch Cordless Sliding Compound Miter Saw (Tool Only) is rated 4.8 out of 5 by 65. Rated 3 out of 5 by Michael from Poor design Getting the blade in and out is a struggle. Especially if you use a blade that's slightly thicker than the stock dewalt blade. Rated 5 out of 5 by Metrodraft from Awesome Saw! I have several Dewalt cordless tools but was a little skeptical on purchasing a mitre saw as I wasn't sure it would be powerful enough. No issues there. It's no different than the corded mitre saw I've had for years. I cannot believe how much I love using a miter saw and not having to worry about a cord. I make furniture and do a lot of DIY stuff around the home. This is perfect for me. It's rugged and easy to carry around since it's so light weight. I have never liked a lazer but the shadow line feature is superb. You will not be disappointing if you buy this saw. Rated 5 out of 5 by happy from I just Love it. Light weight and does the job.... I just Love it. Light weight and does the job. Rated 4 out of 5 by Dewalt Vested from Good - But ... Could Be Better !!! 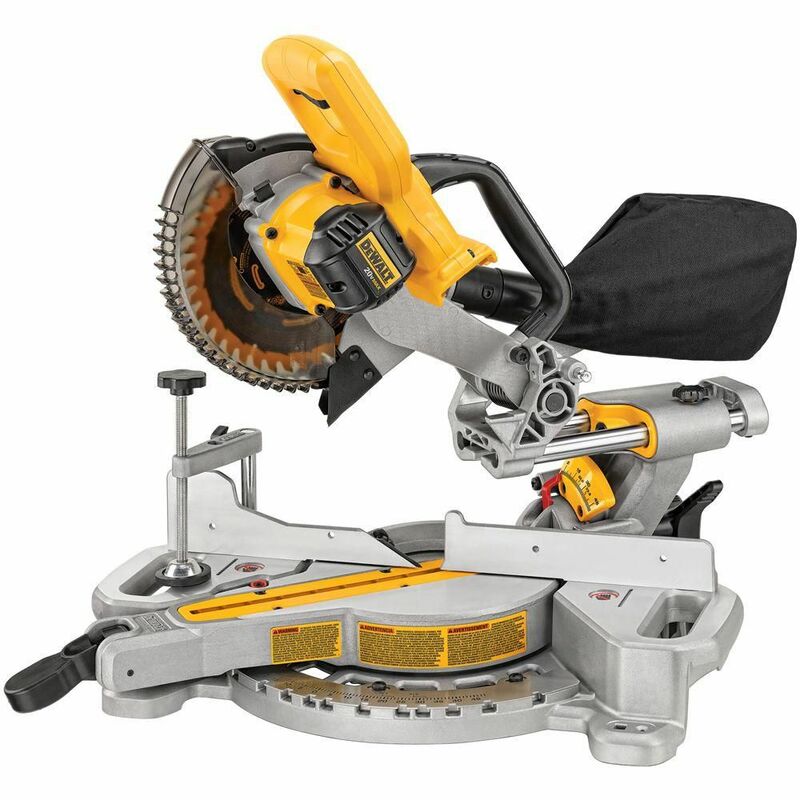 To Dewalt: There are many reviews out there on this saw from big box stores as well as YouTube. There are several reoccurring comments/request from vested Dewalt consumers asking the following to be integrated into this saw : #1) Brushless Motor #2) Double bevel feature #3) Depth Stop. (For Dado's, Half Laps, etc) My comment in addition is the Shadow Light is really just not bright enough for daylight use -maybe add a double tap or mash and hold feature that would produce enough bright light to be seen in daylight as some people would sacrifice some battery life to have a functional light outdoors. *Also important to mention - Not everyone purchasing this saw would be using it as a companion to a larger saw .The large cut capacity of this saw will likely perform 90 percent of what crafters, homeowners, flooring installers and remodelers would need in a miter saw. To sum it up, this is a well built, rugged, suprisingly powerful and accurate little saw that has the cut capacity to satisfy a large arena . I agree with the reviews and out there - Dewalt should give this saw the same respect and functionality as the larger saws !